When you’re face down, immobilized with pain, for nearly three days, there’s not much you can do. DVDs and the TV just frayed my nerves. The endless expanse of the Internet was exhausting. It was hard to concentrate while reading books. Eventually, I gave into the pain and boredom and allowed myself to do nothing. Strange things happen when you are forced to do nothing. For me, old memories, some 20 years old, decided to shake themselves free from the cluttered heap of my brain and sat down with me while they told their stories. They were like old unsolved mysteries, finally made clear. The first memory was of my university dorm-mate who had severe chronic back pain. Often while we were partying or hanging out, he’d have to retreat to his room to lie flat. I never thought twice about it because he was very undramatic about it. But now I know how he felt to have to suddenly stop doing something and rest. The second memory was of me teasing and cajoling my sister into walking. I assumed she was just lazy when she preferred to drive some short distance, instead of walking. Years ago she was in a bad car accident (hit by a drunk driver), and has suffered from back pain ever since. It’s not something you recover from completely. Now when I hobble around, I’m always calculating the shortest distances between places, or eliminating unnecessary walking altogether. So I understand that walking can be an excruciating act. The third memory was of one of my best friends who was hit by a car while crossing an intersection. After major surgery, she spent months in rehabilitation, unable to do basic things for herself, dependent on the help of others. At the time, we lived in separate time zones, and I couldn’t get away to visit her and help her out. I regret this. Fortunately, she had a sizeable community of friends who assisted her. At the time, I couldn’t fathom the feeling of helplessness and depression she had to go through. Now I can appreciate the devastating emotional impact of losing mobility and independence. A fourth memory was of a woman that I was involved with briefly. When I first visited her apartment I was aghast at the mess. There was stuff everywhere, paper strewn all over the place, clothes in messy piles, half-eaten food in the corners. Every square foot of the floor had some collage of disarray. At night, she arranged several small pillows underneath various parts of her body to be comfortable. I thought she was just crazy and neurotic. But I realize now that she was probably suffering from some chronic pain and she physically couldn’t be bothered to tidy or clean things up. I get this now because simple things like washing the dishes, folding the laundry, or taking out the trash takes a great deal more effort now, and was impossible during my days of immobility. My final memory wasn’t so much of a memory as it was just thinking of one of my close buddies. I wrote about Jerry in a previous post and it happens to be one of the most popularly read, so you should read it yourself. In a nutshell, I don’t know anyone who has experienced more physical trauma than he has, yet he’s emerged out of it as one of the most vibrant, creative and dynamic people I know. Thinking of him, and the others I’ve mentioned, gave me a little more courage to deal with my troubles. I used to think I knew what pain was. But that was just muscle soreness, joint stiffness, twisted ankles, sprained thumbs, shoulder tension. Deep nerve pain is a totally different animal. And then there are varying levels of that. I reached a point where my pain tolerance was fried and I couldn’t move, even with strong painkillers. And from this emerged a simple equation, that pain equals compassion. 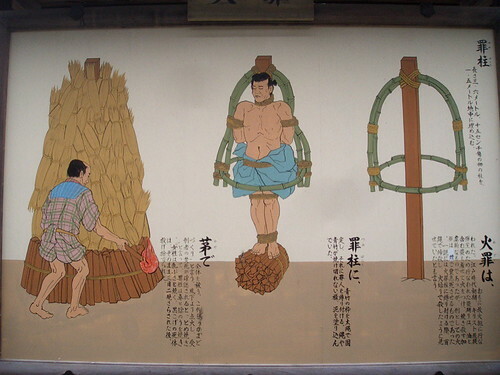 1. from a display in Nikko, Japan, explaining how criminals were burned. 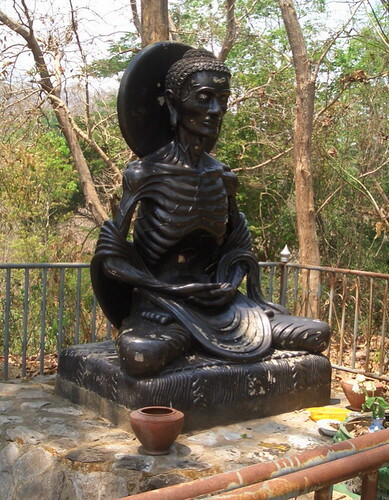 2. a statue of Buddha meditating in a temple in Chiang Mai, Thailand. 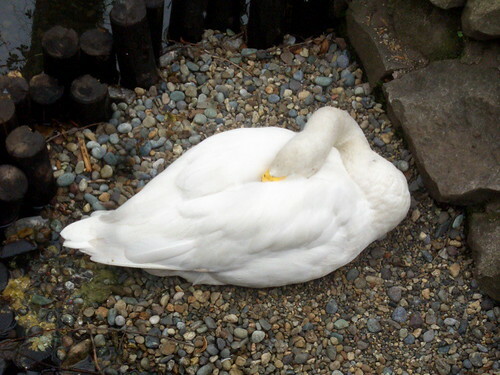 3. a swan at the Inokashira Zoo in Kichijoji, Japan. i don’t think you should get down on yourself. it’s hard to understand unless you go through it. Wind, this is such an insightful post. It is so difficult to truly understand the suffering of others. Thank you for revealing what is often behind the curtain. thanks. i’ll certainly try to be more understanding of others now. so i guess it’s been a good lesson for me. I had no idea you were in so much pain. What caused all of it and how are you doing now?